Holmar is a self catering house situated in a lovely area of the north end of South Uist called Loch Carnan. 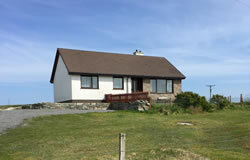 It is a quiet and peaceful location and has fantastic views over the sea to Skye and to the hills on South Uist. The house consists of a kitchen/diner, sitting room, bathroom, two double bedrooms and one single room and can sleep up to 5 people. All island attractions and facilities are easily reached by car from here. Within a few miles on the neighbouring island there are other shops and attractions and also a Community School which houses a games hall, swimming pool, fitness suite, café and a well stocked library. No Wi-Fi and sorry no pets can stay at the property.